To commemorate her Diamond Jubilee, the Royal Horticultural Society presented their royal patron, Queen Elizabeth, with this specially commissioned brooch. Inspired by the flower representing the Chelsea Flower Show Week, the Iris Unguicularis, the brooch comes from designer Kristjan Eyjolfsson. It uses 100% recycled British white gold alongside a mix of conflict-free diamonds and other stones; in total, there is a single large yellow diamond in the center, 30 tourmalines, 20 amethysts, 15 diamonds, and 60 sapphires (one for each year of the Queen's reign). The cost of the brooch has been reported at £40,000. 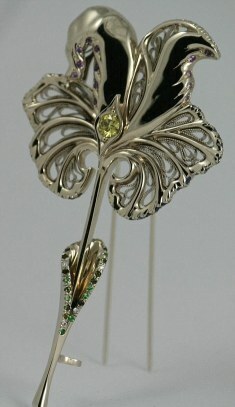 The brooch made its public debut at the 2013 Chelsea Flower Show and became a regular selection for the event after that.